Mary was born at the Palace of Placentia at Greenwich on February 18, 1516, the only surviving child of King Henry VIII of England and Catherine of Aragon. Her baptism was celebrated two days later in the church of the Observant Friars next to the Palace. As Mary grew, her appearance was described as short in stature, thin, and frail with a low-bridged nose, red hair and a fair complexion with light colored lips and ruddy cheeks. She had a loud, deep voice. He eyes were grey and she was shortsighted like her father. She was stubborn, had a quick temper and didn’t like to be crossed. Mary’s early life was centered on her household. She was given a highly classical education overseen by her mother who consulted the Spanish humanist Juan Vives. She was very precocious and could play the lute and the virginals, sing and dance and ride horseback. She grew up loved and confident and she adored her parents. Mary was raised to believe she would be a royal consort and was given very little training to become a sovereign. She wasn’t expected to rule. Early on many marriages were discussed as Mary became a bargaining chip in the dynastic games played by her father with the royal families of Valois and Hapsburg. By the age of two she was betrothed to François, dauphin of France. After three years, this alliance unraveled and other marriages were considered including Mary’s cousin Holy Roman Emperor Charles V, another cousin James V, King of Scots and King Francis I’s second son Henri, Duke of Orleans. None of these marriages materialized. King Henry’s mistress Bessie Blount gave birth to a son Henry Fitzroy in 1519 and Henry showered him with titles and riches. Catherine of Aragon voiced her objections to this as she saw Fitzroy as a threat to Mary’s place in the succession. Consequently, Henry ordered the formation of a household for Mary at Ludlow in 1525 for her to govern Wales with her own council. This was the traditional role for the heir to the throne. While some referred to Mary as Princess of Wales, there is no evidence she was ever vested with the actual title. Mary lived in Ludlow for nineteen months and continued her education under the guidance of Margaret Pole, Countess of Salisbury. While she was away from court, she was insulated from developments there such as her father falling for Anne Boleyn, one of her mother’s ladies-in-waiting. When Mary returned to court, it was obvious her parents’ relationship had changed. 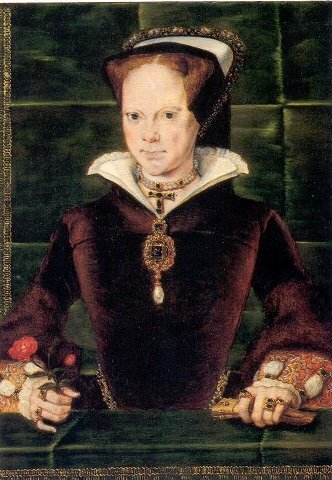 Mary sided with her mother from the very beginning and the situation remained extremely stressful until Catherine of Aragon was banished from court in 1531. Mary’s position became increasingly difficult. 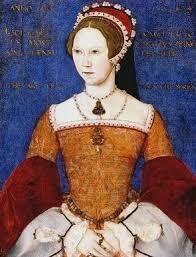 King Henry married Anne Boleyn and she gave birth to Princess Elizabeth on September 7, 1533. The Act of Succession was passed and Mary was declared illegitimate, could not longer call herself Princess or refer to her mother as Queen. Mary lost her own household and was forced to move into Elizabeth’s. While living there under the care of Lady Anne Shelton, a relative of Anne Boleyn’s, Mary was subjected to ill-treatment if not outright abuse. Mary refused to give in to her father’s demands. It was during this time she began to suffer a serious and debilitating illness that would plague her for the rest of her life. At one point, the badgering became so intolerable, she asked Eustace Chapuys, the Spanish Ambassador to arrange for her to escape. But the plan was never executed. This state of affairs lasted until her mother died in January of 1536, Anne Boleyn was beheaded that May and King Henry married Jane Seymour. After considerable bullying by her father and Thomas Cromwell, Mary was forced into a complete capitulation that summer. She acknowledged she was illegitimate and that her mother had never been queen. In return, she was given her own reduced household and new talks commenced for her marriage. 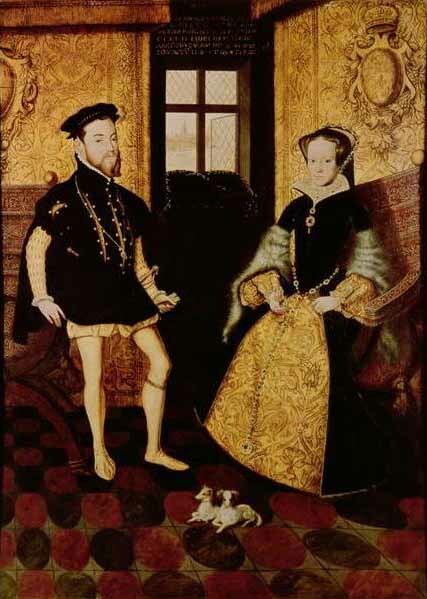 Mary had an amiable relationship with Queen Jane and was sincerely relieved when Prince Edward was born in October of 1537 and agreed to serve as his godmother. She now had enough income to live in a manner in keeping with her status and to travel around the country as she pleased. Mary sincerely mourned the death of Queen Jane. Her father’s marriage to Anne of Cleves did not last long enough to have an impact on Mary. Although Mary was not especially friendly with Catherine Howard, she did reside on the queen’s side at court until the queen’s execution. Henry then sent her to live in Prince Edward’s household. At Christmas of 1542, Mary was at court along with several of her ladies. One of these women was Katherine Parr who attracted the King’s attention. When Henry married Katherine Parr, Mary was one of the eighteen witnesses who attended the wedding ceremony at Hampton Court. The next three years would be the most peaceful and pleasurable of Mary’s life. Mary and Queen Katherine were only four years apart in age and enjoyed many common interests such as jewels, fashion and humanist studies. She openly indulged in the pleasures of court life. Henry VIII died on January 28, 1547 and Edward became king with Edward Seymour, Duke of Somerset acting as Lord Protector during his minority. Mary initially had cordial relations with the Seymours and she continued to live in Queen Katherine’s household until April. Henry VIII’s will confirmed her place in the succession, giving her ample income and properties and making her one of the richest landowners in the country. She began to cultivate her own following and used her position to resist any further religious changes to her beloved Catholicism. She maintained that Henry VIII’s religious settlement should remain in place with no considerable alterations until Edward reached his majority. Relying on the implicit support of her cousin, Holy Roman Emperor Charles V, she became the focus of hope for religious conservatives. In open defiance of the king and to the consternation of the Duke of Somerset, Mary made an overt show of celebrating Catholic mass in her household. Several attempts were made during Edward’s reign to stop her from celebrating mass but Mary remained resolute. Following a coup in 1549, the Duke of Somerset was ousted from his position as Lord Protector and John Dudley, Earl of Warwick (later Duke of Northumberland) took over Somerset’s duties as the driving force of the regency council. Dudley pushed for even further religious changes resulting in a showdown with Mary. By the spring of 1550, Mary was in a stand-off. She had three alternatives: to submit to the king, press for a foreign marriage or escape. She chose to escape and an elaborate plan was put in place and executed with the help of Charles V. But Mary lost her nerve at the last minute. Relations remained tense between Mary and the king’s council. Under the influence of Dudley and his tutor, King Edward was given an assignment to rewrite his will as part of his lessons. The thought of the Catholic Mary becoming queen and reversing the advances of Protestantism in England was anathema to Edward. Part of the exercise was to compose a ‘devise’ which in theory excluded Mary as the rightful heir to the throne of England and bestowed it on his cousins the Grey family who were descendants of Henry VIII’s sister Mary Tudor. These cousins were all girls, the eldest of which was Jane Grey. Eventually this schoolroom exercise was transformed into letters patent, signed by the king and his council. Although the king could legally issue letters patent, there were arguments at the time that changing the succession would require Parliamentary approval which never materialized. King Edward became mortally ill and died on July 6, 1553. Despite the objections of some of the council, Dudley and others proclaimed Jane Grey queen and she was lodged in the Tower to await her coronation. Nobody expected Mary to challenge this course of events but they soon discovered they had underestimated her. From her base in East Anglia at Kenninghall, Mary surrounded herself with many loyal servants. She sent out letters and pleas, asking men to join her in securing her legal right to the throne. Eventually she had the support of about fifteen thousand men. Meanwhile, in London, the council were becoming nervous and decided to send Dudley and some troops to confront Mary. But even before he made it to East Anglia, he capitulated and Mary entered London in triumph. Jane Grey, her father Henry Grey and Dudley were imprisoned to await trial. Mary Tudor was now truly Queen. One of the first items of business for Mary was to overturn her father’s legislation making her illegitimate and had her mother’s status legally declared Queen. An appropriate protestant funeral was organized for King Edward and a magnificent coronation ceremony was staged with much rejoicing and cheers. Mary awarded her supporters with gifts, lands and positions on her council. The next urgent matter of business was to arrange for her marriage. There was much deliberation and discussion over the appropriate candidates but the consensus came down to two men. The ‘English’ candidate was Edward Courtenay, 1st Earl of Devon. He was from a Catholic family of the nobility but due to his father’s treason during the reign of King Henry VIII, he had spent most of his youth in the Tower. Although he was educated, he lacked the necessary social and political skills required to build a base of power. When Mary released him upon her accession, he engaged in inappropriate behavior which led Mary to deem him unsuitable as a husband. The ‘foreign’ candidate under consideration was Mary’s cousin, King Philip II of Spain, the son of Holy Roman Emperor Charles V. Mary found him to be the most suitable person to marry due to his rank and experience as a monarch. After much personal reflection, meditation and consultation with Simon Renard, the Imperial ambassador, Mary announced her decision to marry Philip. This did not go over well with her council. The nobles, the council and the people of England were worried about the influence of the Spaniards on the government of the country and rebellion was in the air. Even the common people protested the marriage. 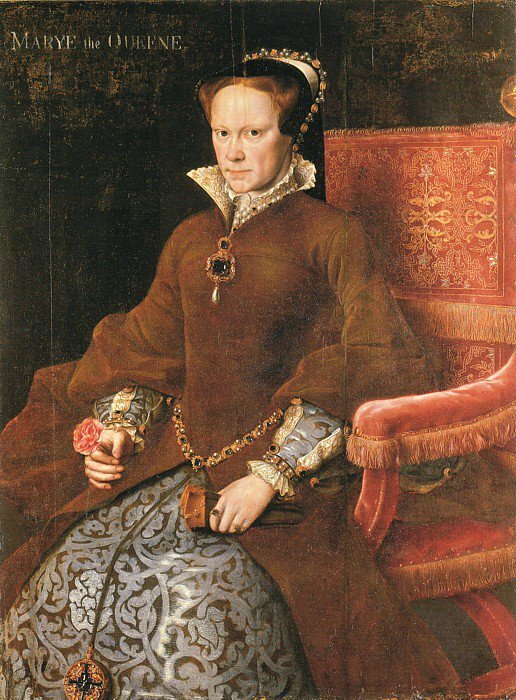 A large group of nobles, including Sir Thomas Wyatt and Henry Grey, Lady Jane Grey’s father (he had been released from the Tower after his wife asked the queen for mercy) began an elaborate plot to overthrow Queen Mary and replace her with her sister Elizabeth and Edward Courtenay. The rebellion was hatched in several areas of the country and was not coordinated enough to have the desired impact. Some of the rebels were caught and imprisoned. Wyatt and this troops managed to enter London and threaten the Queen. On February 1, 1554, Mary made an impassioned and effective speech at the Guildhall, calling on the people to rally and beat back the rebels. It was one of the most significant moments of her reign. Wyatt and his troops backed off and he was imprisoned and eventually executed. 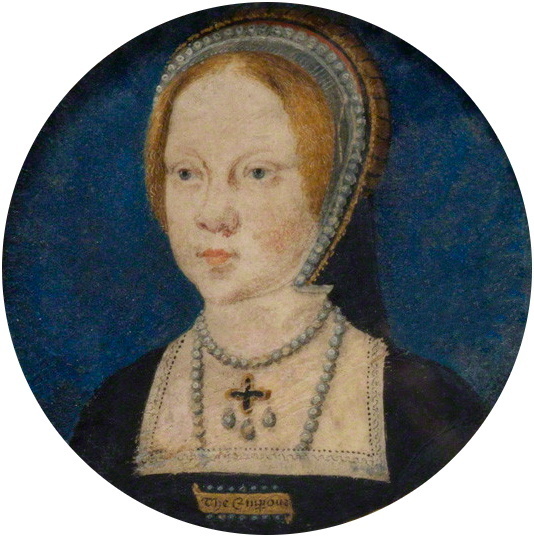 Jane Grey, her husband and her father were also beheaded. Mary was now free to marry her prince. On July 25, 1554, a splendid marriage ceremony took place at Winchester Cathedral. Almost immediately, Philip took up duties as king although the marriage contract gave him little actual power. Mary soon declared she was pregnant. In the spring of 1555, she took to her chambers to await the birth. However, no child came. Eventually she had to admit she was not pregnant and Philip left England to resume his responsibilities as King of Spain. Mary was in a state of deep depression with his departure. Mary’s most cherished ambition was the restoration of Catholicism as the principal religion in England. Mary believed a small political faction of councilors during Edward’s reign had imposed religious changes and that most of the English people had not accepted them. The first proclamation she issued on August 18, 1553 was a cautious decree stating she would not coerce her subjects into Catholicism until Parliament was opened. The effort to turn the clock back to 1529 threatened the ownership of monastic and ecclesiastical lands for those who acquired them after the Dissolution of the Monasteries in 1536. It became obvious many would resist the complete return to Catholicism and Mary compromised by allowing the ecclesiastical lands to remain with their owners and to merely abolish the Edwardian reforms to the church. Further reform would await the return of the papal legate Cardinal Reginald Pole in 1554. A ceremony was held to restore Roman primacy in England and Pole gave a speech before Mary, Philip and Parliament stressing reconciliation in exchange for the withdrawal of all ecclesiastical legislation after 1529 with the notable exception of the laws relating to ecclesiastical lands. Pole then began his reforms of the church according to his humanistic vision. But because he had been out of the country for twenty years, he underestimated the damage which had occurred to the ecclesiastical infrastructure and finance and became bogged down in dealing with these issues. While Pole’s programs for reform were for the most part positive, the negative side was the quest to root out heresy which Mary, Pole and other reformers believed was a cancer requiring removal for the health of society. It was also deemed that the elimination of heresy would speed up the restoration of Catholic worship. When the heresy laws of the fourteenth century were restored, the result was the execution of prominent protestants such as Hugh Latimer, Thomas Cranmer and Nicholas Ridley as well as other popular preachers. However, their deaths failed to discredit Protestantism. The government expanded the search for more heretics resulting in the execution of two hundred and ninety people, predominantly from the lower classes in south-east England. These public burnings were notably unpopular and Mary’s advisers were divided in the assessment of their effectiveness and necessity. The question remains to this day who was responsible for these unfortunate events as there is a lack of conclusive evidence and those who wrote about the events tried to deflect blame. While there is no direct evidence of Mary’s participation in the executions, other than that of Cranmer, the fact remains she could have stopped them and did not. Philip returned to England in March of 1557 for a short period to enlist the support of England in his war against the French. Reluctantly, England entered the fray but their participation directly led to the loss of Calais which had been in English hands since the reign of Edward III. This was a terrible blow to Mary, her council and to England. Mary once again believed she was pregnant but no child appeared. Philip realistically judged that if Mary Queen of Scots, who was married to the French dauphin, ascended to the English throne, it would not be to the advantage of Spain. Therefore, he convinced Mary to name her half-sister Elizabeth as her heir before returning to the Low Countries, never to see Mary again. Aside from war, Mary and her council had many problems to resolve. Her government inherited serious debt problems but implemented reforms which took some time to be effective. The coinage of the realm had been debased and action was taken against forgers of domestic and foreign currency. Discussions took place regarding a restructuring of the coinage with these ideas being implemented by Queen Elizabeth during her reign. Mary had a progressive commercial policy which was welcomed by the English merchants. The government restructured the book of rates in 1558, leading to an increase in revenue. By late 1558, the countryside was dealing with the effects of extreme weather. The rain just never stopped causing a series of poor harvests which lead to famine. Mary’s government did what it could to help out those localities which had been affected. On top of this, a particularly virulent epidemic of the flu began to permeate England. Mary herself may have contracted the flu in the late summer and became so prostrate, her influence on government began to wane. After a short rally in September, a dangerous fever took hold and she gradually declined. When it was apparent death was imminent, Mary officially acknowledged Elizabeth as her heir on November. Mary died on November 17. There was a suitable funeral for her and she was buried in the Lady Chapel of Westminster Abbey. Elizabeth, learning from Mary’s successes and failures, would build upon the foundations of Mary’s reign.